Client MITSUBISHI KAGAKU MEDIA CO. LTD.
Verbatim, the world's leading storage media brand, entered the Japanese market in 2009. On this occasion, a promotional campaign was started, to familiarize the Japanese audience with the brand name, the brand concept and the company's stylish products. 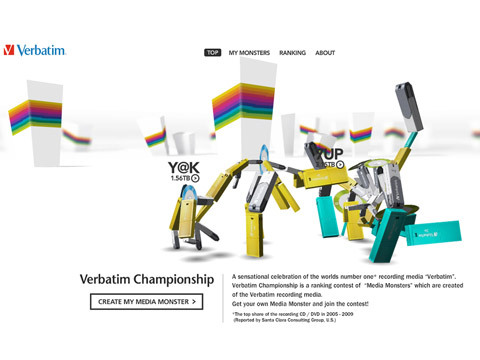 We created the framework for a series of user-customizable characters called “Media Monsters” that signify three key aspects of the company that should be instantly recognizable to consumer, and an online fighting game - called the "Verbatim Championship". Also, we aimed to attract the target: regular PC users, in order to harness the explosive popularity in their community.